Ever since growth hacking became a ‘thing,’ the Internet has been overloaded with endless lists of growth hacking tools. After “How can I learn to be a growth hacker?” or “What are the best resources for growth hackers? ;”, “What tools growth hackers use” is the most commonly-searched query. On a day-to-day basis, beside having the right growth mindset, growth hackers need different tools and skills: Understanding of analytics, landing page optimization, social media and content, email marketing, build referral programs, etc. For every need, there is now the tool, and there are new tools coming up every day — just take a look at today’s Product Hunt frontpage to get a better understanding of the variety of tools that are out there. The real problem with having an infinite amount of tools is finding the right one, when you need it. This is why we started Ultimate List Of Tools For Growth Hackers List spreadsheet. The UOGHTLS is a public spreadsheet anyone can add their favorite tools to. The spreadsheet is broken down into different categories according to the skills and product category a growth hacker needs for their daily work: Content marketing, WordPress plugins, automation tools, email marketing, analytics, funnel optimization, and so on. In the spreadsheet, you can easily see what tools are available, what they do, and how they are priced. You can grab the list here and start adding your favorite tools – and of course, feel free to pass it forward. We’ve already started adding our favorite tools, but to make this list a really amazing resource, we will need your help with adding more tools that we might not even know about. So feel free to go in and start adding your tools. 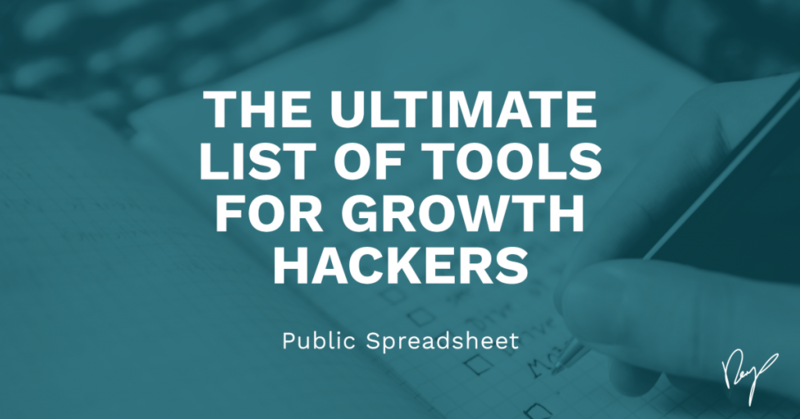 As mentioned before, the spreadsheet was created to help growth hackers find the right tools when they need them, so please share it with your community so they can also benefit from our groups effort. So, what are your favorite growth hacking tools?